NPC18 was bursting at the seams of the Ernest Morial Convention Center in New Orleans on Sunday, overflowing with educational sessions, imperative conversations on equity and affordable housing, and the opening of the Exhibit Hall with the Exhibitor Meet and Greet. Read on to see what you may have missed (and relive what you saw) in this run down of Day 2 of NPC18. "Though Something May Be Legal, It May Not Be Ethical"
The Ethics Cases of the Year session was highly engaging with spirited audience participation. The panelists led an interactive question-and-answer session covering ethical scenarios involving social media, plagiarism, charitable gifts, Certification Maintenance credits, and more. In many of the described cases, the AICP planners sought legal advice from an attorney, but still turned to the AICP Code of Ethics and Professional Conduct to further clarify their decision making. 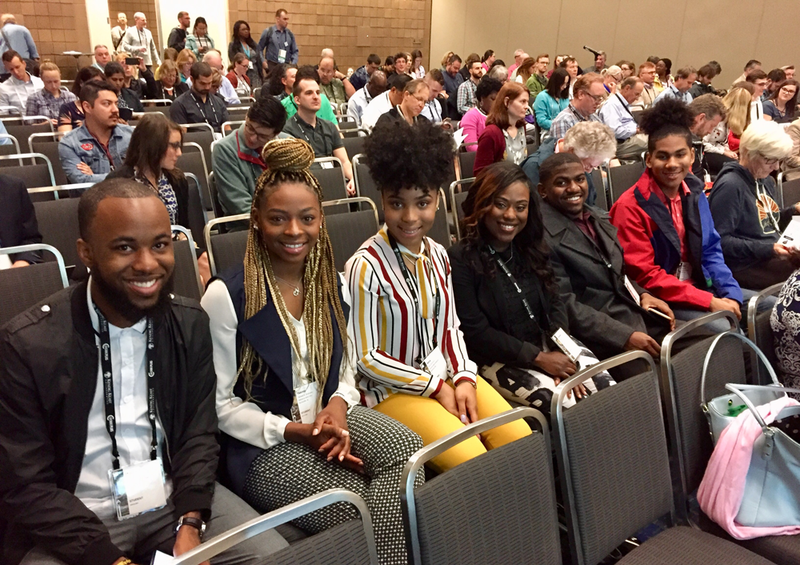 Alabama A&M students (from left) Marley Hicks, Tamani Simmons, Tayla Solomon, Mykeanna Dotson, Tyler Ricks, and Mario Dofat at the "Affordable Housing in Multimillion-Dollar Markets" session. Photo by Lindsay Nieman. "A lot of our affordable housing is not meeting the needs of our residents," Gwen Miller, AICP, land use director and town planner of Lennox, Massachusetts, told a packed room Saturday morning. Along with three other planners from New England, she shared some local lessons — and universal challenges — from recent attempts to provide affordable housing in low-density areas with little subsidized housing, booming seasonal tourism, and sprawling second-home estates. Adam Turner, executive director of Martha's Vineyard Commission, summed up the solution in one slide: "Government must intervene! The free market will not develop affordable housing in these conditions." More than 100 planners met today to help formulate the foundation for APA's coming official policies on social equity and inclusive growth, housing, and surface transportation. The annual Delegate Assembly is just one way members can get involved in drafting official APA policy positions. APA President Cynthia Bowen, FAICP, led a panel discussion with Majestic Lane, Jessica Zimbabwe, and Carlton Eley on fostering social equity in and through planning. Panelists and attendees had an insightful and incisive conversation around equity planning, the need for neighborhood-specific strategies, and taking a leadership role on issues that planners may have been uncomfortable doing in the past. This session was part two of a three-part series titled Fostering Social Equity and Inclusive Growth — the third and final installment is a live webinar on May 29, 2018. 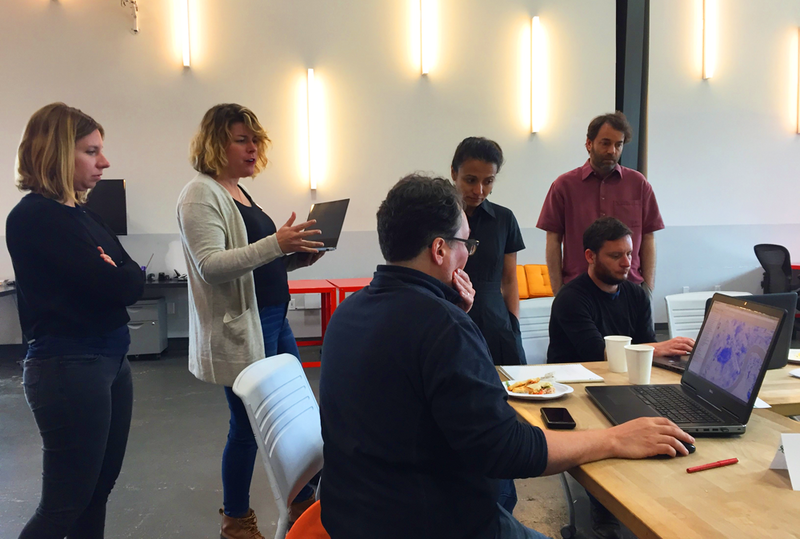 At the Data Jam (from left): Laura Mellem, City of New Orleans; Allison DeJong, Propeller incubator; Ramiro Diaz, Waggonner & Ball; Julia Kumari Drapkin, I See Change; James Gillie, City of New Orleans; and Tim Johnson, American Planning Association. Photo by Lindsay Nieman. Over sandwiches and GIS data at NPC18's Data Jam, planners, programmers, and water experts from host Propeller Incubator, I See Change, the city of New Orleans, the Gulf Restoration Network, Isidore Newman School, Tulane University, and Waggonner & Ball Architects worked with APA staff to create an interactive tool to help New Orleans residents understand their flood impact. They'll be presenting their tool at 9:45 a.m. Tuesday at the Tech Zone Presentation stage. Congratulations to the Class of 2018 FAICP Fellows! 2018 Class of Fellows. Photo by Jim Reineke, Riverview Photography. Sixty-four new Fellows were inducted into the College of Fellows of the American Institute of Certified Planners on Sunday. Congratulations on this outstanding achievement! All attendees who made a donation of $20 or more to the APA Foundation during NPC18 were entered to win a VIP ride in an autonomous vehicle shuttle on the streets around the convention center. The winners took their driverless ride Sunday afternoon in the New Orleans sun. FEMA and APA took over the Tech Zone presentation stage during the Exhibitor Meet and Greet on Sunday night. After a briefing about the record climate disasters that occurred in the United States in 2017, representatives from both organizations discussed FEMA and APA's 25-year strategic partnership in hazard mitigation planning. FEMA representatives were also on hand in the Exhibit Hall to meet with attendees about how they can leverage tools to improve efforts in their communities. The annual Exhibitor Meet and Greet closed out the evening at the Convention Center. Attendees mingled with exhibitors and each other, checked out the latest in planning technology in the Tech Zone, and met with APA staff at the APA Pavilion. Our Twitter account has the full walkthrough below. NPC18 attendees have been sharing every minute of the conference on social media. See what they've been talking about by following #NPC18. Top image: A discussion in the poster display area at NPC18. Photo by Linda Reineke, Riverview Photography.